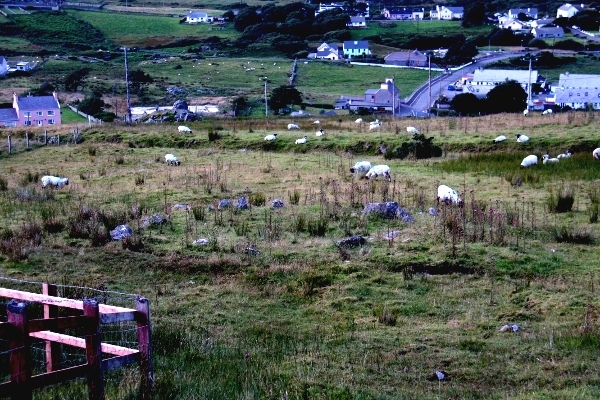 An expert has confirmed that a stone circle on the southern side of the Gleann Cholm Cille valley most likely dates to the Bronze Age, ending a riddle that has puzzled archaeologists for decades. The structure, a “ring cairn” made up of “two concentric stone circles, with cairn material between them, the outer circle lower than the inner circle”, was examined recently by Caimin O’Brien, an archaeologist with the Archaeological Survey of Ireland. “What I used to call mountains in Offaly I will never be describe as mountains again after a few days here,” Mr O’Brien said during a break in his survey of the valley. The stone circle is “probably the first half of the bronze age”, meaning it dates to anywhere between 2600BC and 600BC, most likely before 1500BC. The discovery was made possible by Seamus McGinley, a native of the area studying archaeology as a mature student in Galway, who researched old papers describing the archaeological heritage of the area and interviewed local people about their knowledge to fill in the gaps in the record. Paula Harvey (former curator of Donegal County Museum and Field Monument Advisor for County Donegal) and Sean O’Beirn also worked on the project and played a significant role in the discoveries through hundreds of hours of field walking. Archaeologists were previously puzzled that the valley shows evidence of human activity in the stone age, and later in the iron age and early Christian era up to the present, but not during the bronze age. The new discovery confirms that people have lived there continuously for up to six thousand years. The monument is one of several which will now be added to the official ‘Record of Monuments and Places’, an index of all archaeological sites in Ireland. Several of the other sites had previously been recorded in the ‘Sites and Monuments Record’, which lists possible monuments and ruins less than 300 years old, but are now confirmed in the record. Among the newly confirmed sites are three bullaun stones in the valley, a fourth bullaun stone on the Pilgrim Path to Sliabh Liag, a promontory fort in Malainn MhÃ³r, and a possible court tomb now confirmed by the discovery of the cairn. Two holy wells in Cill Ghabhlaigh [Kilgoly] have also been ‘re-discovered’ thanks to the research. The wells had been lost in the archaeological inventory, as the only mention of them was a vague reference in a 1936 list of Holy Wells in Donegal, but their locations survived in the local folk memory and has now been recorded properly. Details of the new field survey will be presented during Heritage Week at the Oideas Gael centre, along with a description by Martina McCarthy of Geoarc Ltd on the continuing work at Straid Early Christian site and the Portal Tomb Complex in Malainn Mhór. Support for the ongoing surveys and research projects comes from Oideas Gael and the Heritage Council. The events will also include a lecture on the conservation of traditional buildings in Donegal by Dr Greg Stevenson of the University of Wales.